This entry was posted in Racing on June 1, 2014 by Steve Tilford. 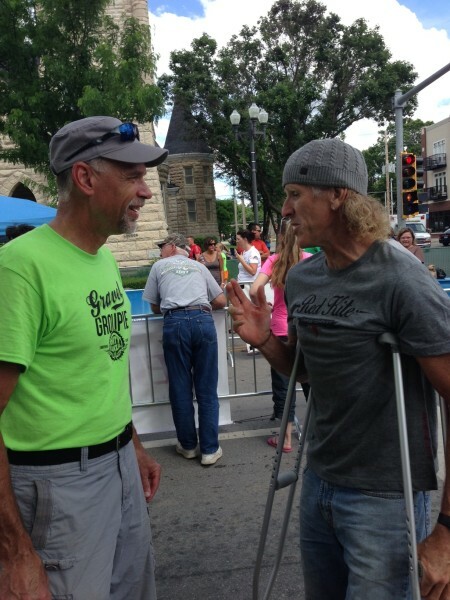 Yesterday was the Dirty Kanza 200 mile gravel road epic, in Emporia, 50 miles from where I live. 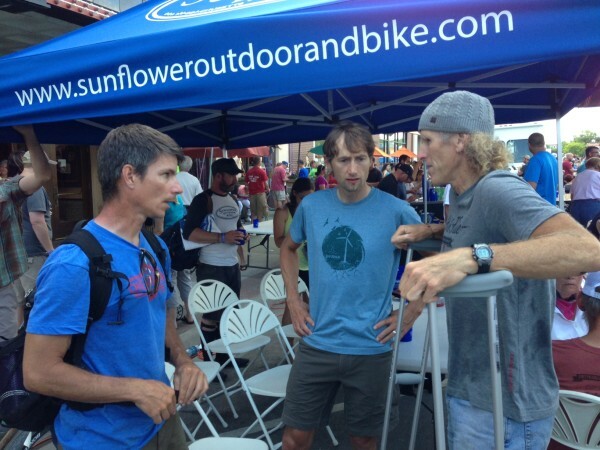 The race has really blossomed the last couple years, with nearly 1500 riders registered to compete this year. I’m not sure what the deal is with these epic races getting so many more participates, but it is nice having so many out-of-staters, come to Kansas to enjoy the Flint Hills. I hadn’t planned to do the race. If I hadn’t broken my hip I would have most likely raced in Oklahoma this weekend. My TradeWind Energy/Eriksen teammate, Brian Jensen had been training pretty good for the event. At least as well as you can, trying to prepare for a 10+ hour race. A couple weeks ago, we went out and he had 150 miles, so I know that he was comfortable in his mind about the duration. That would have been my biggest concern as well. Bill was doing support for Brian, along with Nick Coil and Michelle, Brian’s wife. The stayed in Emporia on Friday night because the race starts at 6 am. It has been taking around 12 hours recently, but I knew that was going to fall. We averaged close to 19 mph on our long ride and I didn’t see any reason that it would be much slower. I heard that there were about 20 riders at the first check point at 50 miles. Brian was the most worried about Neil Shirley. I’d told him about Neil and that he was a rider to be reckoned with. Neil works for Jimmy Mac’s High Torque and has bee doing these one-up, Grand Fondo, gravel type events for a while now. He won the Belgian Waffle Ride in San Diego about a month ago. It was 138 miles and he did it in 6:40 or so. That is pretty fast considering the climbing. Anyway, Bill texted me and said that Neil had ripped off his rear derailleur before the first check point, so on paper, for me, Brian was a ringer. I guess somewhere around 80 miles in, there were no many guys together and Brian decided to have a go on his own. He rode the last 120 miles on his own. I had advised him to ride easy until everyone was on similar footing, then it was fine to do his thing, which is ride super hard forever. 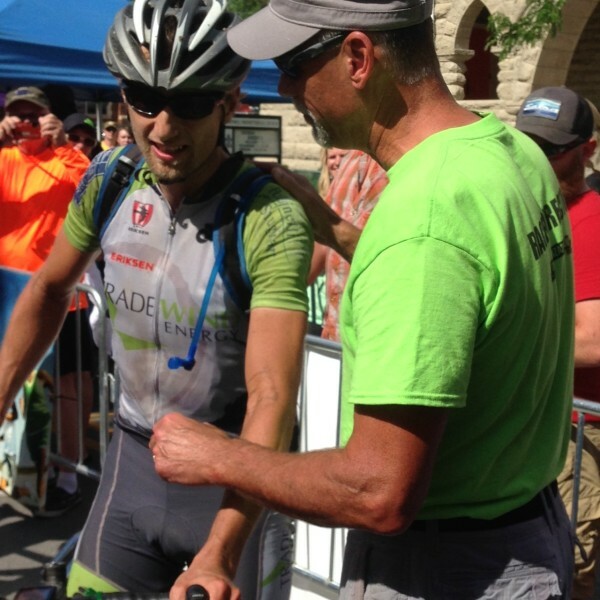 He came into the final checkpoint 50 miles out with a 16 minute lead. That is when Trudi and I got into the car and did the hour drive over. I didn’t feel much like getting out, but I know the event was super important to Brian and didn’t want to miss the end. He ended up winning by 22 minutes over the Kona rider, Barry Wicks. Barry told me that he flatted early and had to chance back on. He said he went super hard and was only by himself for 30 minutes or so. That is still a big effort if you’re going to be on your bike 11 hours. I guess it was a new course record. 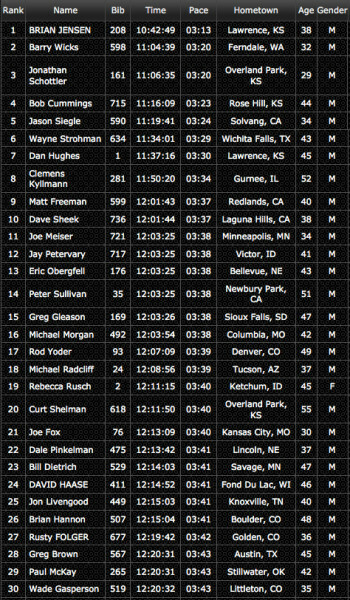 I don’t really believe in course records for MTB races and events such as these. There are way too many variables to be comparing one year to the new. I believe the course switches up, which is a good reason it can’t be a new course record, plus, there is new gravel, rain, heat, etc. that makes it very unfair to compare. But, that being said, Brian did ride the 200 miles a lot faster than has ever been done historically. Barry Wicks finished 2nd. Jon Schottler, from Missouri, but flew in from Germany was 3rd. 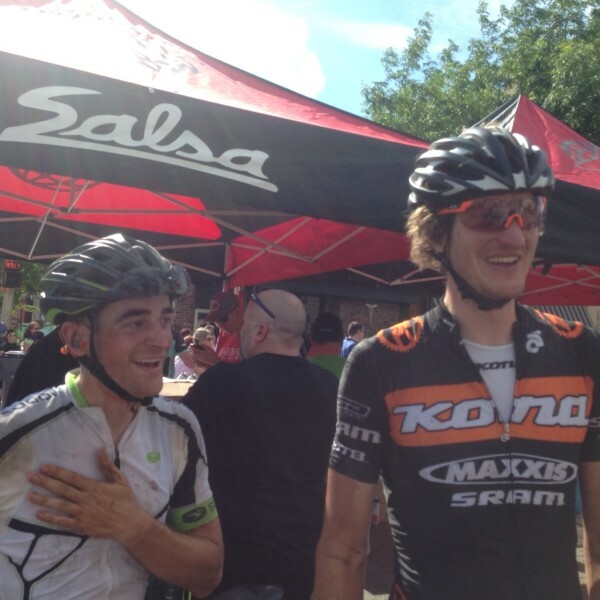 Jon won the Berryman Epic a couple times I rode it and now works for Cannondale in Europe. Next was Bob Cummings, who finished 4th. I guess Josh Johnson was up in the front for a long time, but blew big time and limped in. It is nice having all the guys I locally race with finish in the top 5. Shows that Midwest racing is very competitive. I congratulated all of them. It was fun listening to Barry talk to Jon, or Jon talk to Bob, etc. about their experiences out on the course. None of the three knew each other before, so they didn’t have any knowledge about their capabilities. I liked to listen and envision the thought process they were going through trying to figure out the other riders. Barry said that he stopped with 20 miles to go and filled his bottle (bottom for Rod) from a hose at a farmhouse. Bob said that is when he rode back up to him. Barry was saying something about Bob, “the big guy with the aero bars”. It must of blown Barry away having to deal with Bob out there after 9 + hours of racing. Pretty fun stuff. So, I hung out at the finish for a couple hours, but finally had to go. I was pretty done. Standing too much puts a lot of pressure on my hip. Plus, getting up and down out of chairs, multiple times, is exhausting. I went to bed around 9 and slept pretty soundly to 5 am. That was a post operation record. My leg feels pretty good today, not much pain. I’m still beat, but it has only been 6 days. It is getting better on a daily basis, so I’m pretty optimistic still. 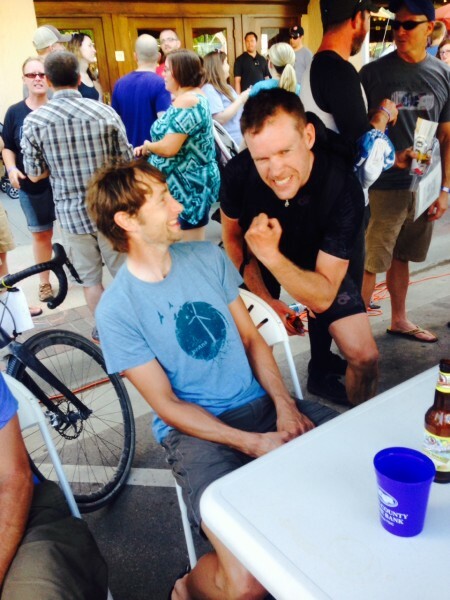 I might have to sign up for the Dirty Kanza next year. I had ridden enough miles I think I would have been okay this year, but you never know. It looks like a race that you want on your bucket list. 200 miles of gravel through the Kansas Flint Hills. Pretty good stuff. Overall Results. Rebecca Rusch won the women’s race and finished 19th overall. Pretty incredible. Brian talking to the race director, Jim Cummings, after he won. Jim and I before Brian rolled in. 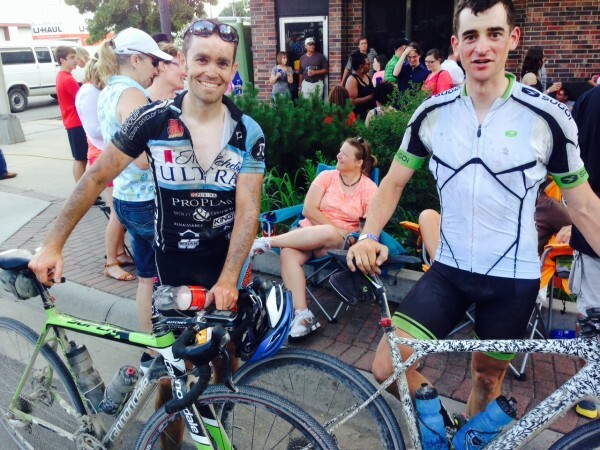 This is Josh Johnson, on the left, with 3rd place finisher, Jonathan Schottler. 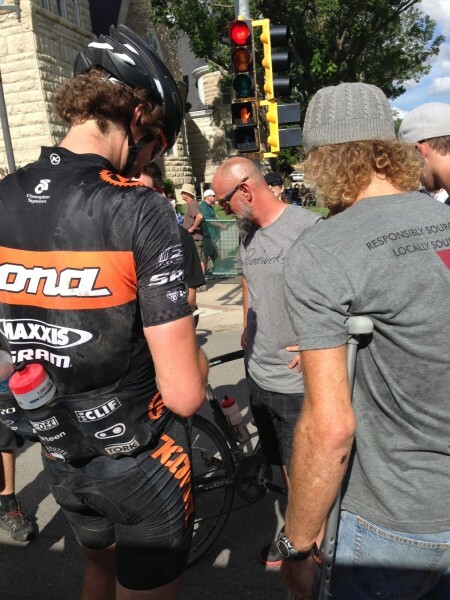 They rode the race a few years ago and Josh flatted a ton and Jon waited for him while he changed his flats. I think they were off their bikes over an hour that year. Brian, after the race, with 4 time winner, Dan Hughes. I think Dan had won the previous 3 years. He flatted early on and had some issues, but still finished in 7th. Pretty tenacious. At least the winner’s trophy stays in Lawrence Kansas and didn’t travel out of state. Talking to BIll and Brian after Brian got cleaned up. Bill was pretty wasted, having gotten up at 4 am and being on his feet all day. He said that he would have rather ridden the race than work it, after the fact. Jon Schottler and Barry Wicks. They only finished a couple minutes apart. Barry seemed pretty good with the whole experience. He was unlucky, flatting early, but said that Brian was a level above everyone else, which is true. I always tried to empty my bottom before a race. It never occurred to me to fill my bottom during a race. Sorry, even if you are on meds Steve I couldn’t pass up that one.